A Mudra is a gesture, normally of the hand, employed in meditation to channel energy. Mudra's are used along with the 'asanas', or seated postures I yogic practices to help the practitioner to focus. Mudra's can be relatively simple, involving the placing of the hands on the lap in a formation designed to balance energy along with the rest of the body in its symmetrical meditation pose. Other more complex mudra's are used in conjunction with the asana and chants or mantras to evoke certain feelings or to help focus on particular notions. For instance, the 'Varada Mudra' focuses upon compassion and charity, whilst the 'Abhaya Mudra' stands for peace and a dispelling of fear. Mudra's are not generally practiced in simple form of meditation in the West, which aim simply to pass on a sense of wellbeing to the practitioner. It could be argued, in fact, that they are ritualistic and unnecessary, serving to complicate an otherwise very simple practice. However, mudra's and other Hindu meditation methods have been developed over centuries, so if you wish to utilise them, there is every reason why they may benefit you. 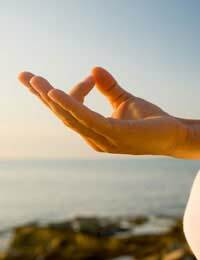 It is said by some yogic practitioners that the mudra formations occur spontaneously to some people during meditation, when they are attuned with some aspects of the divine, or of spiritual truth., yet unless you are practicing a particular form of yoga, there is no reason to expect this to happen, and you may prefer, in any case, to choose the hand position that is most comfortable for you. When using a Mudra meditate as you usually do, either by counting breath's or by repeating a mantra. At the same time hold your chosen Mudra for a couple of minutes, extending this hold to up to fifteen minutes after you have had practice. The Mudra's should be held symmetrically with both of your hands held in the same position. More advanced yogic practitioners may a different Mudra in each hand, as can be seen in some iconographic paintings. However, it is best to pursue yogic practice with a teacher before you begin complex Mudra meditation. A simple Mudra exercise involves a Mudra that can be discreetly employed anywhere by simply touching your thumb and index finger together at the tips, whilst the rest of your fingers are held extending from your hands in a relaxed manner. This is said to open your lower chakra and increase the flow of energy about your body. The 'Om' mantra would be a good one to chant with this Mudra if you are in a position to do so, if not the inner repetition of a positive affirmation may be just as effective (see related articles for further information in both cases). In a variation of this, Mudra's in which you touch your middle sand ring finger with your thumb help to develop (respectively) patience and self-confidence. Using these Mudra's can help you to at least focus your meditation and to concentrate on developing particular skills. Along with Mantra's they can reinforce positive mental attitudes in the mind. This is an excellent and informative site.